In today’s modern world development is been rapid. Every one or there would be purchasing homes, vehicles, jewels, properties, business etc. In spite of having all the potential needed to uplift there status of life, few people would be finding it difficult to increase their life status. When you look around for the spiritual reason, it would be only one, which is Negative energy (Nazar in Hindi) surround you. To overcome this negative energies people would be roaming around looking for the remedies for it. In addition, they end up with hefty priced remedial measures. Even after paying such hefty priced remedy there is no guarantee for its effectiveness. Moreover, the negative energy affected person would remain the same. The method, which you are reading now, is recommend by our Astrologer Mr. Srinivasa Temkar and it is best-proven method to get rid of negative energies. Please do read it carefully before starting this remedy. 1. Purchase a small white / red pumpkin. 2. Take bath before starting the procedure. 3. Try to wear an attire of Red / White colour. 4. Cut the pumpkin in to two parts, and remove the seeds and other material from its core and clean it. 5. 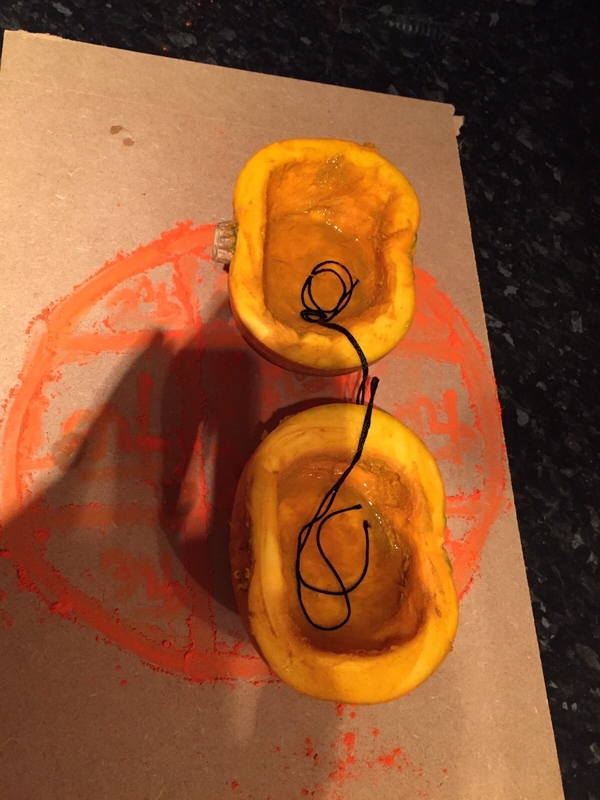 After clean up, make a Haldi paste and coat the inner part of the pumpkin with haldi. 6. Take black colour thread and make two wicks from it for two pumpkin lamps. 7. Add Gingelly oil (Sesame oil) in the two pumpkins. In addition, add the black wicks, which you have created. 8. Draw a big circle on the wooden platform and in side write your name / family members name exactly, centre of the circle drawn. 9. Once you have done this draw 3×3 column & rows inside the circle. Moreover, maintain that the names should be within centre box drawn. 10. Rest of the empty boxes fill it with Sanskrit / Hindi letter Hreem. 11. Now place the pumpkin lamps on this exactly center of the circle i.e. on top of your names. 13. Chant the below mantra by closing your eyes and praying for removal of the bad energies what you are affected to. OM YAA DEVI SARVA BHOOTAISHU MAA KUSHMANDA DEVI ROOPENA SAMSTHITHA NAMASTASTHAI, NAMASTASTHAI, NAMASTASTHAI NAMO NAMAHA. For minimum of 4 times or maximum of 40 times. 14. After you have finished chanting take a clean tablespoon coated with normal oil. Place it over the lamps and hold for few seconds. Later take it out and wear the carbon deposit on your forehead as tilak. 15. After doing this wait for 30 minutes and then keep the pumpkin lamps in front of your main entrance door from outside. 16. Wipe the surface where you had written the circle with wet cloth. Do follow this procedure continuous four weeks on every Tuesdays to get benefit. Please note that initially the lamps and the circle has to be written in front of your home temple premises.